The Integrated Bar of the Philippines (IBP), the official organization of all Philippine lawyers, recently appointed Insular Life as provider of group term life insurance for its members nationwide. This exclusive partnership aims to cover all 56,000-strong membership of IBP, in line with one of the main goals of IBP’s first woman National President Atty. Rosario Setias-Reyes, to ensure that all lawyers in the Philippines are covered with life insurance benefits. 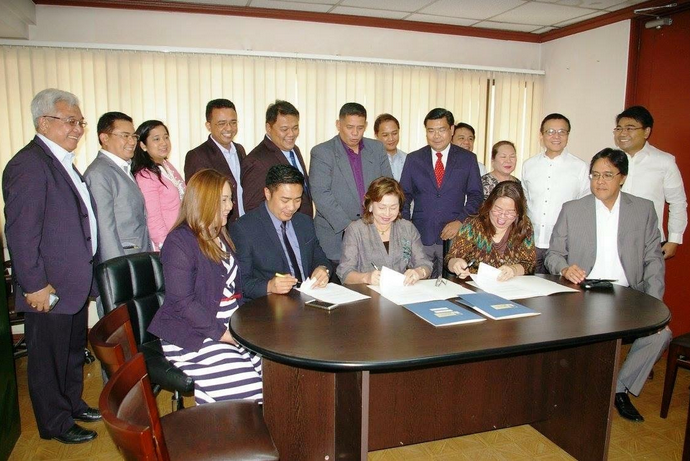 Shown in photo during the MOA signing between IBP and Insular Life are (seated from left:) Governor for Eastern Visayas Atty. Mae Elaine T. Bathan, Vice Chairman, EVP and Governor for Western Visayas Atty. Abdiel Dan Elijah S. Fajardo, IBP President Atty. Rosario T. Setias-Reyes, Insular Life President and COO Mona Lisa B. de la Cruz, and Governor for Southern Luzon Atty. Bienvenido I. Somera, Jr. Witnessing the signing of the agreement are (standing from left:) Deputy Director for Bar Discipline Atty. Avelino V. Sales, Jr., IBP National Director for Peer Assistance, Welfare and Benefits and Insular Life Legal and Corporate Services Division FVP and Head Atty. Renato S. De Jesus, National Secretary Atty. Patricia Ann T. Prodigalidad, Governor for Western Mindanao Atty. Domingo T. Redelosa IV, Governor for Eastern Mindanao Atty. Caesar S. Europa, Governor for Northern Luzon Atty. Franklin B. Calpito, Insular Life Corporate Accounts Department Assistant Manager Gilbert R. Nano, Governor for Central Luzon Atty. Jose I. De la Rama, Jr., Insular Life Corporate Marketing Manager Archie P. Francisco (partly hidden), Insular Life Financial Adviser Jenny Perfecto, Insular Life Vice President for Group Marketing Division Carlito V. Lucas, and Insular Life Senior Assistant Vice President and Corporate Accounts Department Head Lorenzo Luis Liborio Gallardo, II.